204 x 150 mm. – 244 leaves. With 78 pen-and-wash drawings (73 of which full-page), highlighted with colours, all within a double-ruled frame. 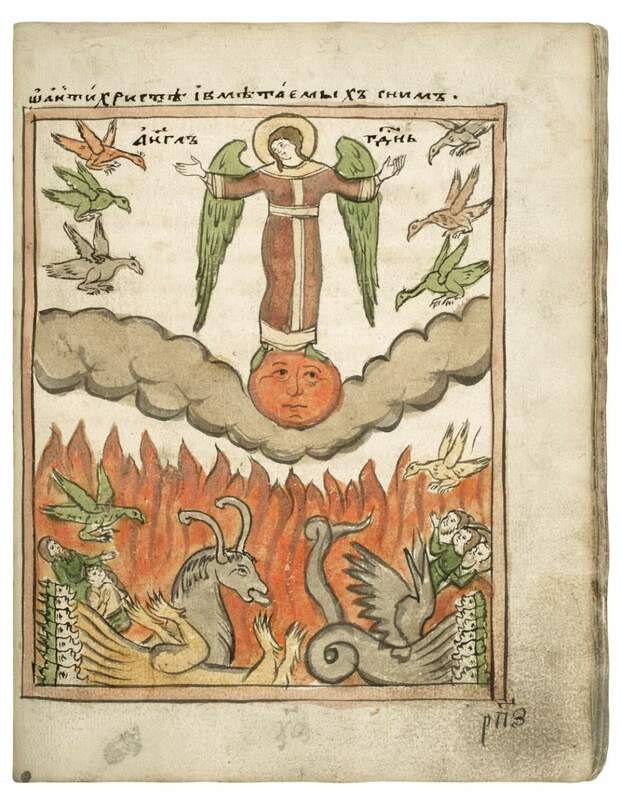 "The Book called Apocalypse", a manuscript in Church Slavonic. The scribe of this lively illustrated Apocalypse manuscript signed his work with his name "Andreij Wassiljew". He was pope in "Preobrashenskaja Zerkow church" at Soligalich, a small town some 500 km east of Moscow. The work took him exactly three months, beginning 27 October 1712 and finishing 27 January 1713. This copy of the Book of Revelation draws its importance mostly on the 78 pen-and-wash drawings that helped to explain the text, which was to be fully read each year in preparation for the feast of Easter – as is still done in several orthodox churches during the week of the Passion. In the book at hand, it is clear that many fingers browsed through the pages, leaving traces on the right-hand corners below. Yet, the book was treated with respect and survived the ages relatively unharmed. The illustrations relate to the text of the Revelation, showing monsters like the seven-headed hell-monster. The iconography portrays different symbols of evil (dragon, beast, and false prophet), which are interchangeably applied. Many architectural details of churches and monasteries are included in a typical 17th- to 18th-century Russian style, and figures are often dressed in the style of this period.